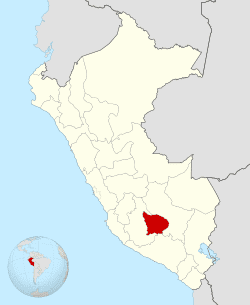 Apurímac is a region in southern-central Peru. It is bordered on the east by the Cusco Region, on the west by the Ayacucho Region, and on the south by the Arequipa and Ayacucho regions. The region's name originates from the Quechua language and means "where the gods speak" in reference to the many mountains of the region (gods in the andean religion) that seem to be talking to each other. Little is known about the region's origins, however chroniclers note that the first settlers were formed by tribes of several regions originating among the Quechua Aymarays. The Chancas, originally from Choclococha and Huancavelica, settled in the region of Andahuaylas. This group of tribes is historically known as rebellious and fearless warriors of ancient Peru. Chronicles relate that the Chancas prepared themselves for years to conquer the imperial city of Cusco. Only due to the great figure and strategy of Inca Pachacutec, the Inca Empire did not yield. By the time the conquerors established the first political organization of the Colony, almost the whole extension of the current region was under the jurisdiction of the authorities of Huamanga; nevertheless, there is no recollection on the foundation of cities and towns. At the beginning of the Republic, Abancay belonged to Cusco. It was not until April 28, 1873 that a law was given to create the department of Apurímac, based on the provinces of Andahuaylas (Ayacucho), Antabamba, Aymaraes and Cotabambas (Cusco), and naming Abancay as its capital. Abancay is the capital and most important economic and political center. Also in the region is Andahuaylas, a rather cold city, located at 2980 meters above sea level (9,800 ft) and the region's agricultural centre. Its main church is the Cathedral de San Pedro, built in Colonial style architecture. A one-piece stone fountain stands out in the Plaza de Armas. Close to Abancay in the way to Cusco is the famed Saywite Stone. Another notable place favored by visitors is Talavera de la Reyna, located 4 km from Andahuaylas. The main square or Plaza de Armas is remarkable, built in stone with an impressive tower with a clock. Nearby, the thermal baths of Hualalache may be visited. Chalhuanca, the capital of the province of Aymaraes, located at 2,800 m (2,100 ft), preserves beautiful churches built during Colonial times, containing fine wood carvings and gold leaf. A detailed account of Apurímac 's architecture can be found in the works of Peruvian Writer and architect Armando Arteaga. In Antabamba, trepanations so accurately performed that astonishing medicines have been found there, in addition to mud sculptures, weapons, domestic utensils, and hunting implements. Considered one of the largest and most beautiful lakes of Peru, Paqucha Lake is located at 3,000 m (9,800 ft) in the route between Andahuaylas and Abancay. Known as an ideal place to rest and enjoy nature, fishing and duck hunting are permitted. A typical Apurímac Region dish is the Watya. Traceable to ancient times, this is prepared by building a fire surrounded by stones, on the center of which potatoes are placed until done. The ancient settlers used to prepare it during sowing and harvesting. Also well known in Apurímac is a dish of potatoes and eggs with uchullaqwa (a hearty sauce made with chili, cottage cheese and wakatay, a very strong tasting Peruvian herb.) Among the variety of breads, we find rejillas, tarapacos, paltos and roscas. January 1 through 6 feature New Year's celebrations in Andahuaylas. During this period the Baja de Negros (dancers disguised as black men) is celebrated. There is entertainment of all sorts, esspecially religious folklore. February is celebrated with Carnivals. The whole town fills the streets to participate in La Yunsa. It is the only opportunity in which Apurímac shows all its folklore, with disguised groups dancing through all quarters. In Andahuaylas, women and men dance in groups day and night. In Grau, bullfights are organized, and the day before, the torril velacuy or velada de toros takes place to drive away evil spirits and avoid any harm to the toreros. In Aymaraes, a sling tournament between several districts takes place, a kind of duel, at times typically leaving several participants wounded. May 13. Fiesta de la Virgen de Fátima. A great demonstration of folklore, specially music and dance. Numerous musical groups arrive to Grau to show their arts. June 24. Farm Products and Livestock Fair in Pachaconas (Antabamba), where the best products of the region are exhibited. A majordomo, called Carguyoc, is in charge of entertaining the guests. July 28. Yawar Fiesta ("blood festival") in Andahuaylas. A special bullfight in which a condor is tied to the back of the bull. In its efforts to release itself from the back of the bull, the condor wounds the bull. The bull is then killed by the condor, or by the villagers. The condor is released after the fiesta. Also, there are cockfights and the traditional ride to the lake Paqucha, for good trout fishing. August 15. Fiesta de la Virgen de la Asunción. The people of Grau crowd the streets to take part in processions and prayers. Simultaneously, the tinka or branding of the cattle takes place. In Cotabambas, the festivity is celebrated with the Yawar Fiesta. September 24. Fiesta de Nuestra Señora de las Mercedes. The whole town of Antabamba is invited to dance, drink, eat or to the bullfights and horse racing. October 7. Fiesta de la Virgen del Rosario. Everyone in Abancay takes part. There are processions and fireworks. The alferado or majordomo is responsible for the expenses of the feast. November 3. The anniversary of the city of Abancay. Celebrated with several sports, folklore and social activities. Also, cockfights and bullfights. December 8. Fiesta de la Virgen de la Concepción. In Cotabambas, dancing is featured in the main square during three or four nights, before and after the celebrations. December 25. During Christmas Eve and Christmas, the people of Cotabambas go out to dance in the streets together with disguised dancers. Large crowds salute the Holy Child in adoration with songs and prayers. There are also processions, fireworks and banquets with typical food. Juan Espinoza Medrano, born in Calcauso, Antabamba. An important baroque writer and priest. Los Zorros de Arriba y los Zorros de Abajo, Quechua poets.